There are many new products in the 2019 price list! They include the HOLeD UP! Universal Dispensers, mobile counters, beverage and condiment dispensers and more. CLICK HERE to download the 2019 Price List. The E1 Silverware Handling System video is a great way to get a quick understanding of the system. Click on the video to learn how it can help you save labor throughout the entire silverware handling cycle while creating a more organized, safer and cleaner dishroom. Saving labor has never been so easy. Watch the below video to see the unit in use! CLICK HERE to download the spec sheet! On September 27th, 2018, Steril-Sil turned 80 years old. Yes, we know the exact date. In those 80 years, we've invented the silverware cylinder, many different silverware dispensers, the silverware basket and we were one of the first foodservice companies to use Nylon in production in the 1950's. Recently we invented the E1 Silverware Handling System and many more design updates and innovations to our every growing product line. And just like in 1938, our products are still all made in the U.S.A. Thank you to all our customers and we look forward to many years of continued success with you. The 2019 Price List is now available. Click the image to download the file today. There are many new products in 2019. Be sure to check out our ever growing choices of carts and mobile counters, our HOLeD UP! Universal Dispensers and or our labor saving E1 Silverware Handling System. Steril-Sil has been #1 in silverware handling and dispensing for 80 years! Steril-Sil's mobile convenience counter system is the most flexible in the industry. Each mobile counter has multiple standard top configurations available. Each of those top configurations have multiple arrangements and options. With a list of available base options and top inserts to help you solve ever issue, you can simply and easily design the exact counter you need. For our showfloor stocking dealers, we now offer a handout to be displayed on the shelves with silverware handling and dispensing products. The Proper Silverware Handling brochure is tri-fold brochure. It features basic tips on dispensing and handling silverware and shows the many options that Steril-Sil and our partner dealers have to offer. Our new E1 Silverware Handling System brochure is now available for download. Click the image to download the file today. Would you like a copy mailed to you? If so, send us an email at sales@sterilsil.com with your name and mailing address and we will send one right out to you. The Cart Chart is a quick reference guide to the many different cart configurations offered by the Steril-Sil Company. The C-Store Guide is a quick reference guide to the most common Steril-Sil products used in convenient store applications. Use our VTC series for to dispense a lot. The HKS series is designed for either countertop or wall-mount applications. And of course include our colored cylinders and containers to add interest. 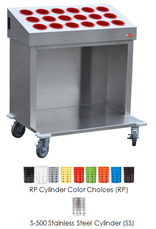 The Steril-Sil 36" Tray and Silverware Cart model CRT36-18 holds the most of any cart in its class. Use the 'RP' designation for colored plastic, specify color(s) on order. You may mix and match colors. Use the 'SS' designation to specify the high capacity S-500 stainless steel silverware cylinders in the cart. Welcome to Steril-Sil. With over 75 years of tradition building dispensing products for the foodservice industry, Steril-Sil has a wide range of solutions for restaurateurs, hospitality and institutional foodservice operations. 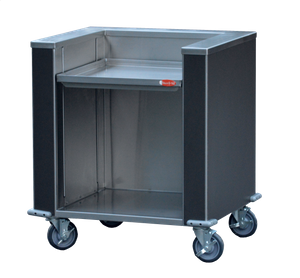 Our product line includes silverware handling and dispensing equipment, insulated and non-insulated condiment dispensers, utility dispensers and raised rails, all with a wide range of uses. All Steril-Sil equipment is manufactured to the highest quality using top grade materials and finishing techniques. We are proud of our deep roots and understanding of the foodservice industry and we will continue to explore and produce space saving and dispensing solutions for foodservice operators.